You do not need to walk the entire distance at the one time, or over consecutive days. 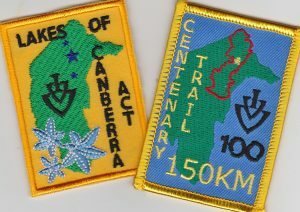 Most people would complete the Lakes of Canberra over 4-5 days of walking, and the Centenary Trail in 7-14 days, and these walks may be spread over several years. Parts of each program are also included in the Canberra Walking Festival each year. The Walk Australia program is new in 2018, and no one has completed this challenge yet. Who will be the first? The special award patch will be unveiled at that time. The special awards are designed to provide a challenge for walkers, with a commemorative patch awarded on completion. Walkers pay a nominal $10 to participate in any of the special programs, and will receive a record booklet/card to record their progress. The fee covers the award on successful completion of the program. Participation in these programs is not limited to IVV walkers, nor do participants need to be a member of AussieWalk. However, walkers may earn IVV credit for completing any individual section of these challenges. If IVV credit is sought then the appropriate walk fee must also be paid. In certain circumstances the IVV fee may be waived (eg for walks completed as part of the Canberra Walking Festival or as part of a walking club or group where walk fees are included etc). Further Australian programs may be developed. The process for developing a new program is described below, and walkers are invited to make submissions for new awards. IVV-Americas has “Walk IVV-Americas” which requires walkers to complete 20 different walks in countries that are part of the IVV-Americas region (which includes Australia). The cost is $10 for a certificate on completion (or $12 if you also want the patch). Australia has a limited number of the record books for purchase. IVV-HQ has a number of special programs including IVV World Cup, Pacific Cup and Europa Cup. The record books for these programs may be purchased from IVV-HQ, see ivv-web.org/ for more information. Many other countries also have special programs which may be of interest if you are planning to travel, so check out their websites before you leave home. Any AussieWalk member may propose a new Special Award program. Each program should require commitment from walkers to complete a walk specified challenge over an extended period, and should not be achievable in just a couple of days of walking. Ideally the program should be able to be segmented into smaller sections of approximately 10km. Sections that require walkers to walk over 25km in a single day should be avoided, because that will preclude participation by many walkers. Design a record booklet/card, with a program of walks segmented into manageable walking sections (approx. 10km where possible). Develop maps and/or GPX files for each walk section, together with written instructions. Note that this step may not be needed if permanent trails already exist for some or all of the walk sections. Submit editable versions of the record booklet, maps and artwork to AussieWalk Committee for approval. Photos taken along the route are also welcome for publicity purposes. AussieWalk will arrange for production of the record booklets and award patches, update the website and publicise the new program.